In return, the metro Detroit automotive industry supplier is giving back in the form of a $500,000 gift from his family to the Business Pavilion project. 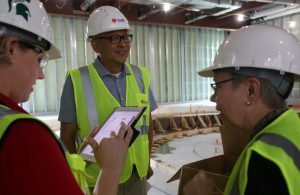 The Frank Yang family is offering the gift toward one of four flexible classrooms in the new facility, scheduled to open in summer 2019. Yang (EMBA ’12) is president of INCODEL Michigan LLC in Romulus, Mich. The flexible classroom being funded by Yang’s gift – which will be known as the INCODEL Michigan classroom – can be customized for multiple uses, amplifying the $62 million, 100,000 square foot building’s mission to be a place of engagement and team-building for students, faculty, alumni, and employers. The gift developed out of the professional relationship between Yang and Lucy Maillette, the college’s current director of new academic initiatives and former EMBA director. During his time at MSU, Yang credits her “positive thinking and flexibility” as critical to his success. “She and some EMBA faculty are among the essential mentors in my career and life,” said Yang. Joining the EMBA program came at a critical point in Yang’s career. He had just left a full-time job, determined to start his own business. 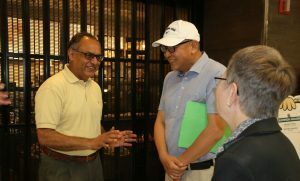 “The first step of my business plan was to apply for the EMBA program at MSU,” he said. Originally from China, with a BS in materials science and engineering from the University of Science and Technology Beijing, and an MS in engineering from Wayne State University, the EMBA program offered Yang an opportunity to share ideas and test business concepts. During his time in the EMBA program, Yang logged many trips to China, Europe, and Brazil, building his business along the way. Yang’s international career includes roles in international shipping, the steel industry, and as a global automotive supplier. INCODEL is a vertically integrated supplier of components and supply chain services to the global automotive industry. Yang is a member of the American Foundry Society, the Society of Automotive Engineers, and the Detroit Chinese Business Association advisory board. For more information on how to contribute to the Business Pavilion, go to https://giving.broad.msu.edu/business-college-pavilion/.